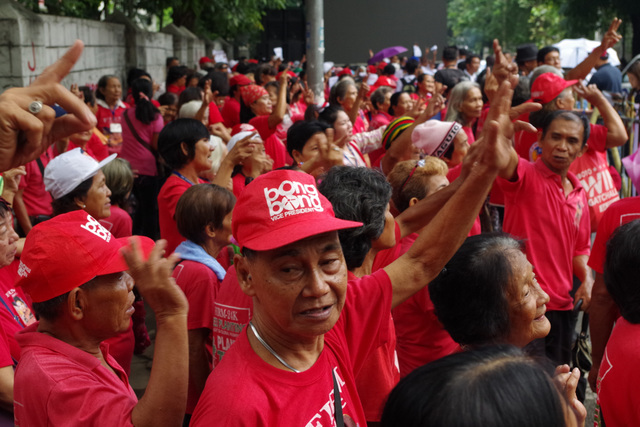 MANILA, Philippines (UPDATED) – Supporters of the late president Ferdinand Marcos began a 4-day march from Ilocos Norte to Manila on Friday, October 14, in time for the anticipated Supreme Court ruling on petitions against a state burial for the late strongman. 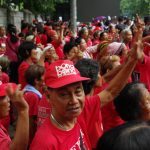 Supporters of the Marcoses in their bailiwick, Ilocos Norte, joined the “Kailian March” headed by Governor Imee Marcos. Kailian is Ilocano for fellow member of a community. From Paoay Church, 500 Ilocanos will pass through the Solid North provinces of Ilocos Sur, La Union, and Pangasinan to meet with fellow loyalists as they make their way to Manila. They will hold prayer vigils in Ilocos Sur, Pangasinan, and Tarlac. The Marcos supporters will also visit the Tomb of the Unknown Soldier in San Fernando City, La Union, to honor the soldiers who died during World War II. The Marcos supporters are expected to arrive at the SC in Manila on Monday, October 17 – a day ahead of the expiration of the status quo ante order (SQAO) issued by the SC. Governor Marcos, together with some Ilocos Norte mayors, will join the group on Monday for a prayer vigil. On September 7, the SC extended its SQAO on a hero’s burial for Marcos at the national shrine to October 18, after two rounds of oral arguments. Martial law victims and human rights advocates filed 6 petitions against the decision of President Rodrigo Duterte to grant Marcos a hero’s burial, the Chief Executive’s campaign promise to Ilocanos and the Marcoses.